Does More Fluoride = More Protection? The Context - Some Shocking Tooth Decay Facts! Over 179,000 teeth were extracted from 0-9-year-olds in dental practices in 2017. 25% of 5-year-olds suffer from tooth decay. Over 45,000 hospital admissions for 0-19-year-olds were due to tooth decay in 2017. A whopping 74% of all adults have had to have a tooth extracted. 66% have visible plaque. It costs the NHS £50m a year on hospital-based tooth extractions for under 19s. Maybe We Should Do Things Differently? You will be aware of the above facts and that many of the people within these statistics are either not brushing their teeth or are hardly ever. It’s difficult for a dental practice to have an impact on them but, there are plenty of others who can be influenced and guided better, with better understanding. For years, the dental profession has been taught and told that more fluoride equals more protection. Professor Robert Hill, research director at the Dental Institute and head of dental physical sciences at Queen Mary University, London challenges this. The dental profession has moved on, innovated and the latest evidence from Queen Mary University turns this assumption on its head and makes the case that actually LESS fluoride means MORE protection! Fluoride has long been seen as the ‘magic bullet’ in dental protection. Since its effect in reducing tooth decay has been recognised, patients have widely been advised to use a toothpaste containing fluoride on a daily basis. It has also generally been accepted that the higher the level of fluoride, the more effective the toothpaste at remineralising damaged tooth enamel, so while most regular UK toothpastes contain fluoride at around 1,450 parts per million (ppm), prescription toothpastes can contain fluoride in concentrations of up to 5,000ppm. Fluoride treatments and varnishes are applied to the teeth of children at risk of caries, and in several regions of the UK, fluoride has been added to the water supply to improve the dental health of local people. There’s no doubt that the introduction of fluoride has had a beneficial effect on the rates of decay, especially among children from deprived backgrounds, but it may be time to reassess the levels of fluoride that are given. Too much fluoride, caused either by fluoride treatment or children ingesting toothpaste, can cause fluorosis. Professor Robert Hill has been researching this area for some years and is convinced that applying ever higher concentrations of fluoride to the teeth does not have the benefit that has previously been believed. Professor Hill and his team have been working on bioactive glasses, initially developed for bone grafting, and have developed a toothpaste that contains a bioactive glass that delivers a combination of calcium, phosphate and fluoride ions to promote effective remineralisation of tooth enamel through the production of fluorapatite, the fluoride analogue of natural tooth mineral. 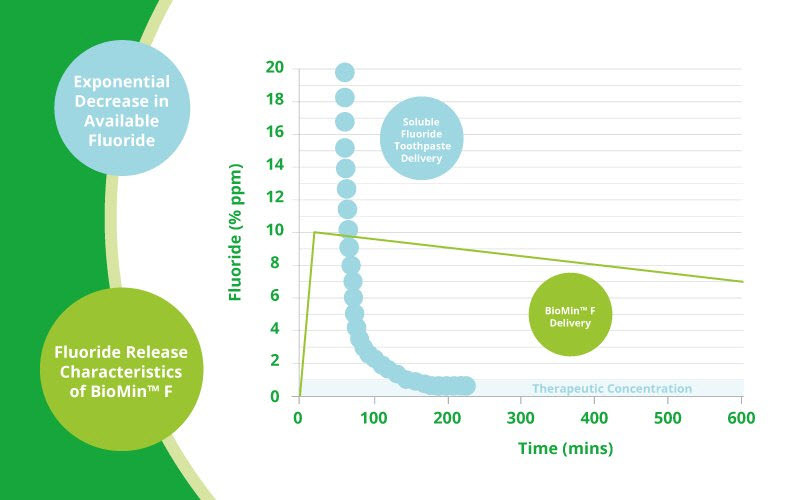 Because the fluoride in BioMin F toothpaste is incorporated within the structure of the glass, it is delivered gradually as the glass dissolves, and therefore a lower concentration (approximately equivalent to 600ppm) is required, yet is actually more effective. The problem with fluoride toothpaste Professor Hill’s experiments have demonstrated that when conventional fluoride toothpaste containing a soluble fluoride such as Sodium fluoride or sodium monofluorophosphate is used, there is an Immediate ‘high’ of fluoride in the mouth, but that this drops rapidly as the toothpaste is washed away by salivary flow, so that after around only 1.5 hours, the amount of fluoride that remains is below therapeutic levels (See graph).